We invite local artists, amateur and professional, to exhibit and/or sell their artwork at the fair on September 20 & 21, 2008. Original art will be accepted from all art media. A brief biography or resume will be appreciated and will be displayed along with your work if you desire. All art should be ready to hang upon delivery. Please bring a label for each piece of art that includes the title, art medium, artist's name and cost if the piece is for sale. You do not have to be there to sell your art; we will sell it for you. To help us keep track of your artwork, we need you to fill out our Art Show and Sale form and bring it with you when you drop off your artwork (attach additional pages as necessary). Art will be displayed in the Bluemont Community Center on the 2nd floor (33846 Snickersville Turnpike). The building will be open on Thursday September 18 from 5 pm to 8 pm and Friday, September 19, from 10 am to 5 pm for you to deliver your art. A $15 donation for exhibiting and/or selling your work will be greatly appreciated. A blue ribbon will be awarded for "Best in the Show." Art may be picked up between 4 pm and 6 pm on Sunday, September 21st. 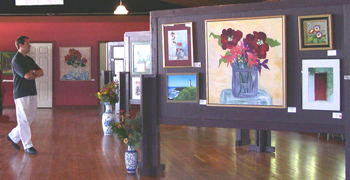 If you are interested in displaying your artwork, or need more information, please contact the Adult Art Show Chair. IMPORTANT: We take every precaution to protect your artwork. The building will be staffed both days during the fair and locked at night but we are not responsible for theft or damage. Artists should insure their own work. All art forms will be accepted. All art work is to have name, grade, school, or phone number written on the back. It is to be delivered to the E.E. Lake Store no later than 5:30 PM on the Friday before the fair. Special arrangements are to be made prior to Friday by either e-mail or phone. All children's art will receive a ribbon. Artwork by children grade 6 and up will be judged for 1st, 2nd, and 3rd place. No children's art will be sold. Contact the Children's Art Show Coordinator.